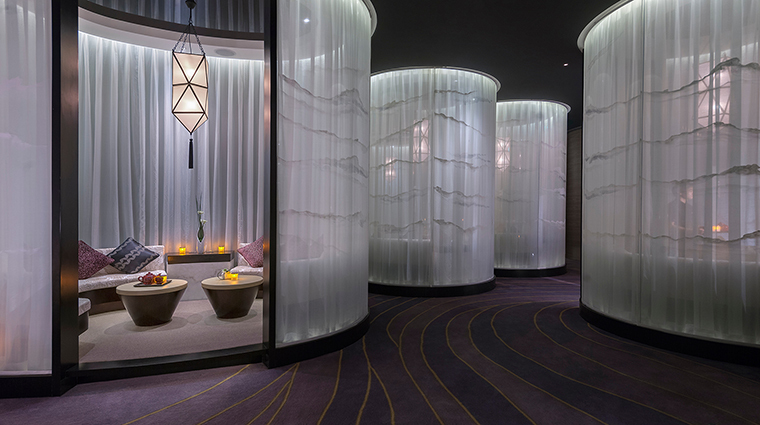 Prepare to be pampered at Forbes Travel Guide Five-Star The Spa at Mandarin Oriental, Guangzhou. 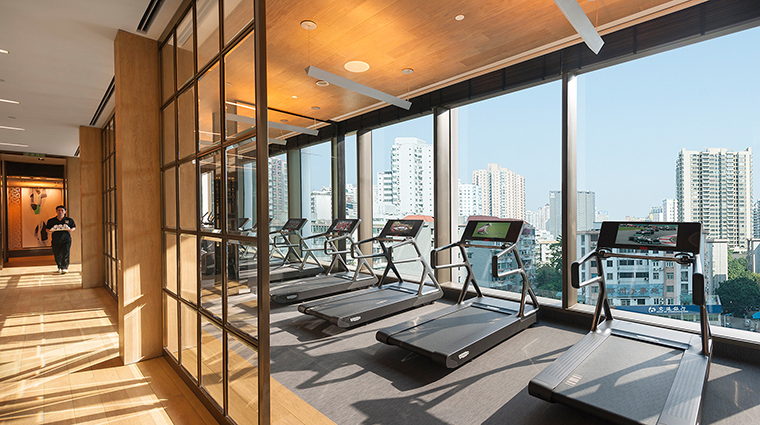 From the main building at Mandarin Oriental, Guangzhou, take the shaded walkway that runs outside past the 82-foot-long heated pool and the private sundeck with massage cabanas (in case you want an alfresco treatment). Upon arrival, you’ll get a full consultation in a curtained-off space. The lush, private consultation pods, in which you can peruse the treatment list, flow like a dragon’s back from the reception area to the treatment rooms. Afterward, you’ll receive a complimentary tian quan session, a Chinese bathing ritual that relieves stress, boosts circulation and opens your pores for the forthcoming service. Finally, you’ll head to the spacious treatment room, which is more like a suite — each comes equipped with its own dressing area and steam shower. 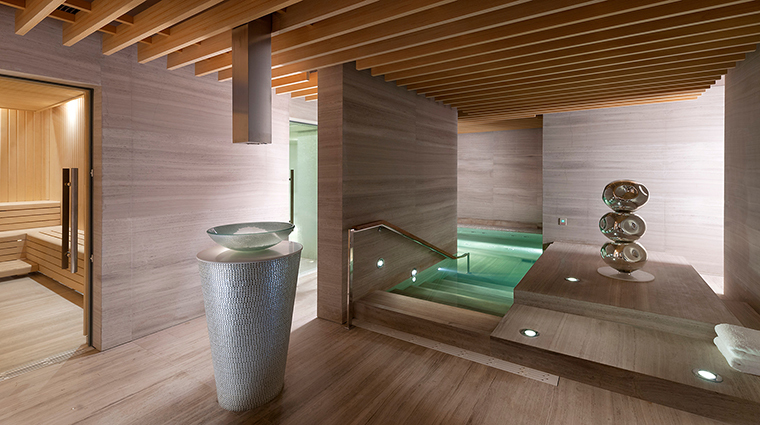 The spa eschews popular Balinese décor for a more Chinese influence, a nod to Mandarin Oriental’s Hong Kong heritage. Carved into a rough-hewn wall is an abstract cross-legged figure holding a fan — Mandarin Oriental’s logo — and in Chinese, the names of flowers. The high-ceilinged lobby has a full-length mirrored display case, a gilded minimalist chandelier and a glittering black-and-gold marble floor. In addition to waxing and nail services, the spa has four skincare treatments aimed at delivering immediate results. Whether you come in for a facial or a massage, expect to be slathered with Natura Bissé products from Barcelona and ESPA products from the United Kingdom. The Guangzhou spa’s exclusive signature services also use Quintessence, a fragrant bespoke essential oil designed by Aromatherapy Associates that blends ginger, mandarin and frankincense. Come to the spa 45 minutes prior to your appointment to squeeze in time in the steam room and sauna, as well as that outdoor pool, a real treat during Guangzhou’s toasty summers. Treatments are quite customizable, and there are four 30-minute add-ons, including the delightfully refreshing jasmine and green tea body scrub. For new moms, we highly recommend getting the Healing Express treatment, which uses microdermabrasion blue light therapy to ease stretch marks, acne scarring and pigmentation. The menu is divided into three sections — general treatments, men’s treatments and beauty treatments. Among the men’s offerings is the two-hour “Mankind,” a salt scrub followed by an oil and hot stone body and head massage. The standard list includes facials, massages and wraps, with some twists thrown in, such as the “Crystal Light,” a two-hour rubdown that incorporates a crystal (which you get to bring home) and sound therapy. The hour-long pre- and post-natal service offers moms-to-be and new parents a mild exfoliation and massage that focuses on targeted areas. The new Diamond Line facial by Natura Bissé, a recent addition to the spa menu, focuses on anti-aging and results-driven treatments. 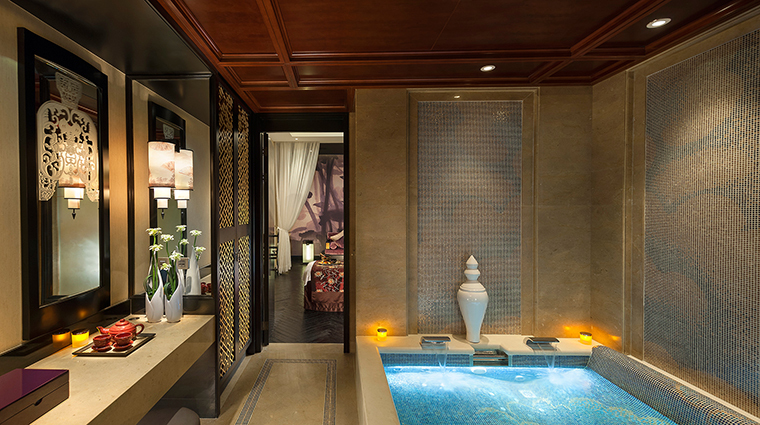 There are nine luxe treatment rooms at the Guangzhou spa, six of these have single beds and two are couples rooms. The ultra-romantic VIP suite, whose hidden door slides silently from the wall at the touch of a button, has its own Jacuzzi, steam and sauna facilities. Rooms also boast a nail treatment area; and a serene, circular yoga space. 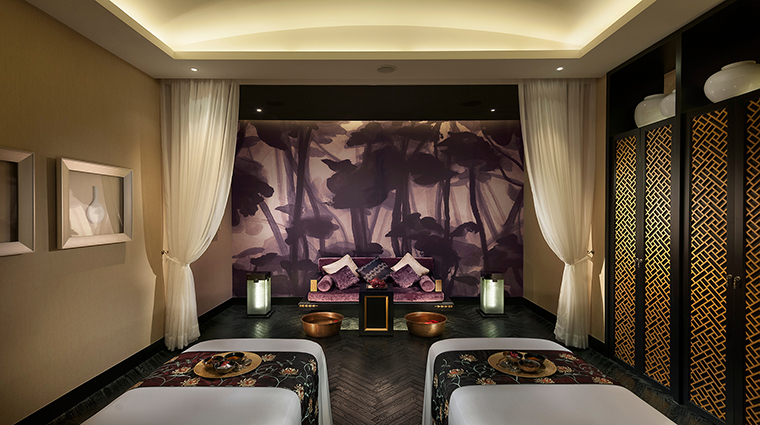 Each treatment room wall holds a piece of statement artwork, a large, richly colored abstract painting of lotus flowers.